Lorraine Walker never set out to become a farmer when she married Nigel Walker, organic pioneer and founder of Eatwell Farm (one of the Ferry Plaza Farmers Market’s first farms). But when Nigel passed away last year after a five-year battle with cancer, Lorraine suddenly found herself at the helm of keeping this beloved organic farm going, and feeding Eatwell’s loyal community of CSA (community supported agriculture) members and farmers market shoppers. She recently shared her inspiring story of self-discovery, love, loss, and resilience on stage of at Real Food Real Stories’ StorySlam: Rooted & Rising. She allowed us to reprint and share it with you here. Tonight’s theme speaks to me in a very literal sense. When you own a farm, what is taking root and what is rising play pretty important roles. But also it speaks to my life in general. As a young person I never felt particularly rooted. I identify as one of the rare-species native San Franciscans, but it has been decades since I lived here. So in thinking about my story I had to look deeply at my roots, and have come to understand that I didn’t have a clear sense of self until fairly recently. There were a few things that held true my whole life: cooking and gathering friends around the table. When I think of my happy place, it has always been in front of the stove. At five, I would sneak into the kitchen to make pancakes. My German mother didn’t like messes, and five-year-olds aren’t the tidiest cooks. She wasn’t an enthusiastic teacher, but I persevered. By my early teens, I was having dinner parties for my friends. I would cook all day and have the best time doing it. As an adult, cooking became my meditation, my way of de-stressing. It was how I comforted people when life was going wrong, and it was how I socialized. Gathering around a table you make community, and that was how I felt connected. The funny thing is, I never wanted to cook professionally. I didn’t want that joy turned into a job. So this thing that is such a big part of me was always only a part of me, almost like a side note, because I could never see how food and community could be all of me. So for most of my life, I guess you could say I never really felt rooted–until I met my husband Nigel. It was never my intention to date a farmer. Farmers are rooted to their land, and Nigel lived in Dixon. I lived in Sonoma County and loved my life there. What I didn’t understand then is farmers are also very good at transplanting things, and that is exactly what Nigel did with me. Before I realized it, my English farmer charmed me right into his life on that farm in Dixon. This farm thing was such a new and different world for me. But I took my time and inched my way in. My first few visits to the farm were for CSA member events, a strawberry-picking Day, a solstice amping party, and then a tomato asting camping party. There were so many people and they were really into food and the farm and this crazy farmer I had already fallen in love with. There was such a beautiful feeling of community and great food. It was exciting to be with a man who was so passionate and immersed in all that he did. Eatwell Farm wasn’t a job for Nigel—Nigel Walker was Eatwell Farm. That first September we were quarantined because they found medfly in town. This meant we couldn’t take any of our tomatoes or peppers or eggplants or pluots off the farm to sell. It was pretty devastating. And so in the first six months of our relationship I was thrown into what could have been a real catastrophe. We decided to have a giant tomato sauce making party because people could take home cooked tomatoes. Nigel told the CSA what was going on, invited folks up for the party, and over 200 people showed up. Late in the day Nigel and I stood there looking down this row of all these crazy people cooking tomatoes and he told me, “Now I can see my dream. I have this farm and I have this incredible community.” And from that point on the primary focus of the business was our CSA community. In 2010 I moved to the farm full time and never looked back. A year later we moved into the hobbit house we were building, four days after that we were married. I had started my own small business, making lacto-fermented soft drinks flavored with herbs from our farm. With the wedding behind us I was ramping up Drinkwell Softers and going into distribution. Our house was designed so I could cook for crowds so we could have farm dinners, and maybe some smaller member events. I wanted to bring kids into my kitchen and teach them how to cook. We had so much to look forward to. Together we would make Eatwell an even bigger beacon for community around local food. Our life together was so exciting and filled with so much joy. I realized as someone who loves food and cooking, being with a farmer is a pretty smart move. And before I knew it this little transplant was taking root. Six months later Nigel was diagnosed with cancer. Five and a half years later, after a long hard fight, I lost him. A farm is not a business you put on hold, no matter how broken your heart is. I have had to set my grief aside and without training attempt to be a farmer. I persuaded my son Cameron to join me and together we have literally had to put on paper the pieces of Eatwell that were stored in Nigel’s head just to keep this business running. To say it has been a struggle would be a huge understatement. But the thing that gets me through all of this is the Eatwell community. To live a life knowing you have so many people supporting you, not just financially but in all ways, is pretty amazing. And I understand now that the greatest gift Nigel ever gave me was this community. The work we do, the decisions I make, effect literally thousands of dinner plates every week. I touch so many people with newsletter articles, and recipes shared. I hear from parents all the time that their kids wouldn’t eat this or that, but they will if it comes from Eatwell. Every time I have a group of kids cooking with me in my kitchen, I am potentially changing their lives. When we have a new CSA member who is worried about eating unknown vegetables and we walk them through that process, I am changing a life. These may not be massive changes, but they can be important and that is what I do. The luck that Nigel and I had was finding our dreams in each other. Every day I rise to the challenge of nurturing and growing that dream on my little farm in Dixon. And now I am Eatwell. 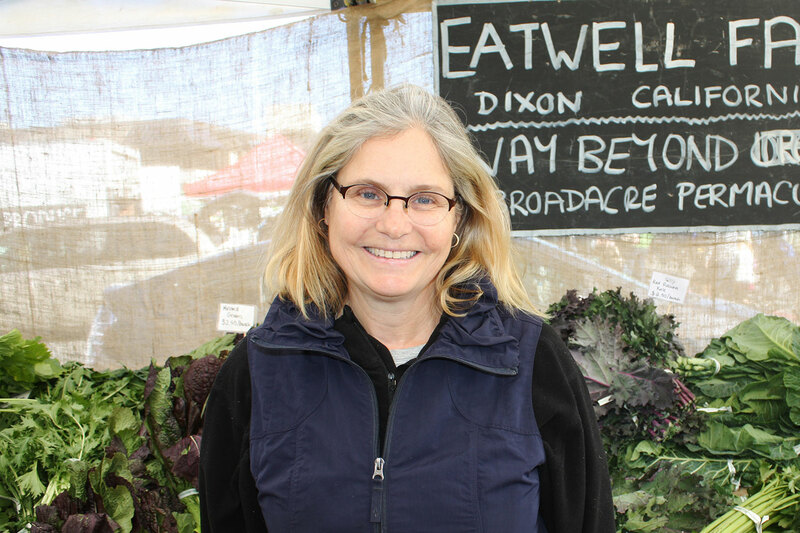 Support Eatwell Farm at the Ferry Plaza Farmers Market on Saturdays and through their CSA program.